AS A filmmaker, Alexander Payne got much acclaim for his character-driven dramas like “Sideways”, “About Schmidt” and “The Descendants”. 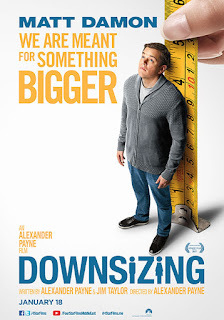 He now comes up with a sci-fi-fantasy movie about the end of the world, “Downsizing”. To save the earth from people who are bent on destructing it, Norwegian scientists found a way to shrink a person to about five or six inches tall through cellular reduction. 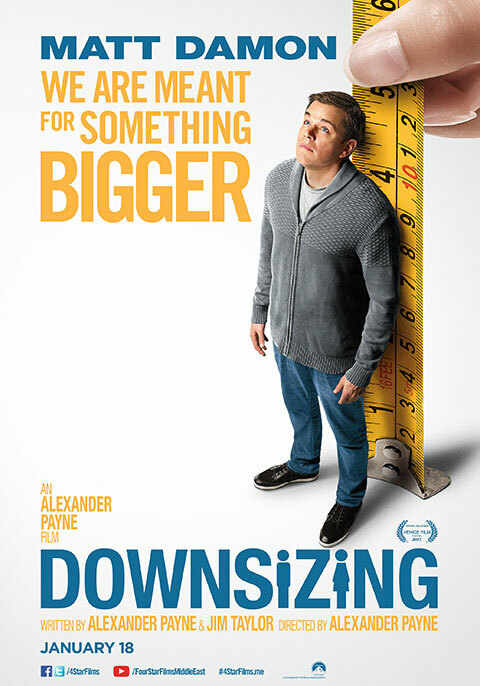 The story is told from the point of view of Paul Safranek (Matt Damon), an occupational therapist, and his wife Audrey (Kristen Wiig), who consider being downsized as this will help them solve their economic woes after their application for mortgage was turned down. And so they submit themselves to be members of Leisureland, a brave new world of miniaturized people who will help save the planet being destroyed by big people. But a problem quickly arises. Paul and his wife are together when they enter the clinic that will downsize them. When Paul wakes up, he learns that his wife has backed out and he’s the only one who gets downsized. They eventually divorce and he lives all alone in his plush apartment. The story starts as a satire on consumerism but Payne is not able to sustain it. The movie runs for more than two hours and lots of parts really make “laylay” and get so boring. Paul becomes the friend of his neighbor, a Serbian black marketeer, Dusan Mirkovic (Christoph Waltz). He attends a party in Dusan’s apartment and gets so drunk he passes out on the floor. When Paul wakes up the following morning, he meets the cleaning lady, Ngoc Lan (Hong Chau), a Vietnamese who is punished for being a dissident, gets downsized and loses one leg. Ngoc Lan then takes him to a depressed area that houses the planet’s unwanted people who become hired servants working for the rich denizens of Leisureland. Dusan convinces Paul to go with him and his business partner, Konrad (Udo Kier), to a mission to Norway’s original downsized community. Ngoc Lan insisted on going with them and romance eventually blooms between her and Paul. There, Paul has to make an important decision about his fate in the unexplained doomsday scenario. It’s not a surprise that the film flopped even in the U.S. since it starts as one thing and Payne doesn’t know where to take it so it ends up as totally another thing. The movie’s second half is actually dominated by Hong Chau as Ngoc Lan. She can be terribly bossy, both exasperating and endearing at the same time. She steals all the scenes she is in and is given hilarious lines of dialogue complete with a proliferation of obscene words that make the audience laugh. There are many other stars who appear in short cameo roles, like Neil Patrick Harris, Jason Sudeikis, Laura Dern, James Van Der Beek, etc. But they’re all just wasted in their respective roles. Matt Damon sleepwalks through his role as Paul and this is his third flop after that costume extravaganza made in China, “The Great Wall”, and that George Clooney-directed nightmare, “Suburbicon”. He’s obviously attracted to this project by the unusual concept of downsized people but it just didn’t work. Maybe he should go back to being “Jason Bourne” or “The Martian”.